Introduction: Worldwide, breast cancer comprises 10.4% of all cancer incidences among women, making it the second most common type of non-skin cancer and the fifth most common cause of cancer death. In 2004, breast cancer caused 519,000 deaths worldwide (7% of cancer deaths; almost 1% of all deaths). Breast surgery is a common procedure performed in women. Many women who undergo breast surgery suffer from ill-defined pain syndromes. Research design and method: Pre experimental research design was used. Fifty women were selected by using convenient sampling technique at government general hospital, Chennai. An interview schedule used for baseline state assessment and visual analogue scale was used for pain assessment and flexi level scale used for assessing shoulder function. the collected data was organized and analyzed by using descriptive and inferential statistics. Results: The Level of pain shows, in the study group 49 (98%) of them had moderate in the pre-test and after the intervention all of them had mild pain in the post test. In relation to level of shoulder function before the intervention shows that in the study group 49 (98%) of them had movement towards gravity and after intervention 24 (48%) of them had movement against gravity maximum resistance and only 5 (10%) of them had movement against gravity. The naadi chudhi pranayama and arm exercise were found to be effective. There was a significant reduction in pain and shoulder stiffness level at a ‘P’ level of <0.001. There was a negative correlation between the pranayama practice and the level of pain, there was a positive correlation between the arm exercise practice and the level of shoulder function. There was no significant association between demographic and clinical variables with the level of pain and shoulder function in the study. Conclusion: Cancer survivors will get benefited by rehabilitation programmes. In the early part of 20th century we faced the threat of infectious diseases. At the end of the 20th century we are in the hands of the dreadful disease like cancer & AIDS .Cancer is potentially the most preventable and the major chronic life threatening diseases. Unfortunately, it is still increasing as a leading killer disease across the globe, especially in the developing world. In 2000, there are an estimated 10 million new cancer cases and 6 million cancer throughout the world. The number of new cancer cases will grow 10 million and the number of deaths will be more than double to over 12 million by 2020. Breast cancer is the second leading cause of cancer deaths in women today and is the most common cancer among women. According to the American Cancer Society, about 1.3 million women will be diagnosed with breast cancer annually worldwide about 465,000 will die from the disease. Breast cancer death rates have been dropping steadily since 1990, according to the Society, because of earlier detection and better treatments, 7.6 million people died from cancer in the world during 2007. A woman is diagnosed with breast cancer every three minutes, adding up to one million cases annually across the world. According to WHO , World Cancer Report, the incidence of breast cancer are one among almost 200 types of cancer could go up by 50 per cent to 1.5 million by 2020. In order to manage this dreadful disease, medical field has discovered many newer therapeutic measures keeping in pace with the modern technology. The advent of breast surgery, availability of reconstructive surgery and durable prosthetic, and the current trends in the surgical techniques guarantees the improved quality of life following breast surgery with palliative care which includes chemotherapy, radiation therapy. The prospect of undergoing surgical pain is unpleasant to almost all no matter how necessary the surgery is. It is a situation from which there is no escape and one must endure it alone. Analysis of the underlying meaning of tears and other emotional experience reveals that pain is not only regarded as a necessary part of treatment by most, but in some instances it is seen as a punishment given to them [2-5]. Joachim reported About 18,00,000 breast surgery are presently performed every year worldwide, and in India Kasliwal stated that 43,000 breast surgeries are being performed every year. Even though there is a vast advance in surgical technique, the anxiety and post-operative pain and shoulder stiffness remains unavoidable. Researchers reported that breast cancer accounted for nearly half of the total annual deaths, 25million in the world. Every year breast cancer & cervix cancer are responsible for 12 million deaths in the world. In India 2.5 million deaths occur on account of breast cancer every year [6-8]. The prospect of undergoing surgical pain is unpleasant to almost all no matter how necessary the surgery is. It is a situation from which there is no escape and one must endure it alone. Analysis of the underlying meaning of tears and other emotional experience reveals that pain is not only regarded as a necessary part of treatment by most, but in some instances it is seen as a punishment given to them. Shoulder stiffness related to surgery and its outcome increases pain perception and the vise–versa. Pain can adversely affect the physiological as well as the psychological recovery following a surgery. Hence relief of pain and prevention of shoulder stiffness remain the major aspects of nursing practice. Julie Adam reports that worldwide Studies have shown that over 10 million mastectomy surgery procedures were performed in the year 2005 alone, a nearly 40% increase since the turn of the new century. Managing post-operative pain continues to be one of the most complex and challenging task encountered by nurses. Nurses are available round the clock to the patients. Hence they are in an excellent position to make significant and unique contribution to the patient’s pain management. To attain post-operative pain control, it is important to incorporate alternative methods of pain management besides administering the routine medication. Pain is a learned behaviour, having psychological as well as physical components. Psychological component of pain is more curable by non-pharmacological modalities than the pain medications. The psychological methods of pain relief are breathing technique, progressive muscle relaxation, bio feedback, imaginary, systematic desensitization, hypnosis, meditation, etc. Such methods can be used as an adjunct to pain medications. Now the question arises about the feasibility of using the techniques such as hypnosis, bio feedback and meditation in the clinical setup as they require either elaborate machines or specially trained personnel. Exercise stimulates cutaneous mechanoreceptors that activate large primary afferents. Exercise is the most widely used therapy in nursing and other paramedic practice. It is one of the ways nurses use to communicate caring to patients and prevent post-operative complications as in mastectomy are lymph edema, shoulder stiffness, swelling. Touch is central to the nurse’s role in healing. Exercise is an extended form of touch, which results in mutual energy exchange. It diverts, soothes pain and produces relaxation. It increases pain thresholds, and therefore modifies an individual’s perception of pain. A 15 min exercise and relaxation technique was found to have a significant immediate effect on the perceptions of pain, nausea, arm stiffness, lymph edema and relaxation when measured with visual analogue pain scale. Nurses need empirically tested pain relieving methods that is simple and rapid in action. Relaxation techniques are found to decrease pain by reducing anxiety and muscle tension. Many investigations experimented the effectiveness of various relaxation techniques either single or in combination. Perry  and Potter  found that more powerful results were produced when techniques were used in combination such as yoga and balancing activity, than having one technique. Moreover, individuals have preferences for a particular technique. By offering more than one technique, there is a greater chance for the participant to pot for a method that best suits her. Many non-pharmacologic methods relieve pain but are not widely used. Complementary therapies are attracting attention and patients are interested in alternatives to bio medicine. The combination of relaxation technique & arm exercise program is more often tested to reduce pain and shoulder stiffness than other combinations. In an attempt to provide nurses a comprehensive less time consuming relaxation technique, which is easily learned and easily taught, the investigator intended to try the twin therapeutic approaches combining pranayama and arm exercise program. A study to assess the effectiveness of twin therapeutic approaches on certain biophysiological parameters in women after breast surgery at selected hospital, Chennai. • Assess the level of pain in women after breast surgery. • Assess the level of shoulder function in women after breast surgery. • Determine the effectiveness of pranayama on level of pain in women after breast surgery. • Determine the effectiveness of arm exercise programme on level of shoulder function in women after breast surgery. • Correlate the practice of pranayama with level of pain in women after breast surgery. • Correlate the practice of arm exercise with level of shoulder function in women after breast surgery. • Associate the selected demographic variables with level of pain in women after breast surgery. • Associate the selected demographic variables with the level of shoulder function in women after breast surgery. It includes pranayama and arm exercise programme to reduce the pain and shoulder stiffness. Naadi chudhi or alternative nostril breathing is a kind of pranayama where the person has to inhale slowly and deeply as long as possible and then exhale the breath without holding it. Naadi chudhi has a marvelously calming effect on the nervous system which helps to relax the mind and refresh the body which consists of left nostril and right nostril breathing for 15 min for three consecutive post-operative days from day three to day five. Each day the morning intervention was given one hour prior to administration of analgesics, then after 11 h the evening intervention was given for the study group. Exercise designed to strengthen the arm muscles and to maintain shoulder and arm mobility, the exercise consist of wand exercise, shoulder blade stretch, shoulder blade squeeze, side bending, chest wall stretch, shoulder stretch for 20 min for three consecutive post-operative days from day three to day five. Each day the morning intervention was given, then after 11 h the evening intervention was given for the study group. It includes pain, shoulder stiffness which occurs in women after breast surgery. Pain is an unpleasant sensation reported by the patients resulting from actual or potential tissue damage at breast and the pain level will be assessed by standardized tool of numerical pain rating scale (visual analogue scale) Numerical pain rating scale is otherwise called marked visual analogue. It is shown to be sensitive to pharmacological and non-pharmacological procedures which alter the experience of pain. Shoulder stiffness is a symptom of patient underwent breast surgery, reported by the patients resulting from actual or potential tissue damage at breast. Unlike shoulder weakness, where patients can have their arm lifted by the examiner (even if the patient can't on his own), a patient with shoulder stiffness has diminished range of motion even when assisted and the level of shoulder function is assessed by the FLEX–SF scale developed. A surgical intervention is performed under direct visualization of the breast to correct breast pathologies such as breast cancer. The breast surgery included for this study are total mastectomy, radical mastectomy, Skin-sparing mastectomy, Partial mastectomy, Lumpectomy, the level of pain and shoulder function is assessed from III post–op day to V post op day. Women of age between 21 to 70 years, diagnosed to have breast cancer, posted for breast surgery by the medical and surgical oncologist and women admitted in medical ward, posted for breast surgery and after surgery when they are transferred in to wards on III post–op day at Department of oncology, Government General Hospital. H1: There is a significant decrease in the level of pain in women after breast surgery who receives Pranayama. H2: There is a significant decrease in the level of pain in women after breast surgery who receives Arm exercise Programme. 1. The study is limited to four weeks. 2. Patients subjected to breast surgery for first time. 1. The results of the study will provide information on level of pain and shoulder function among women undergone mastectomy. 2. The results of the study will help the care givers of patient undergone mastectomy to educate them regarding pranayama and arm exercise program in an institutional set up. 3. The results obtained will bring awareness among nurses to understand magnitude of the problem and importance of nonpharmacological measures to reduce level of pain and improve the shoulder function. In view of accomplishing the main objective of the study an evaluative approach was used. An evaluatory research is the utilisation of scientific research methods and procedures to evaluate a problem, treatment practice or policy. It uses analytic means to document the worth of an activity. Pre experimental one group pre-test, post-test design was chosen to assess the effectiveness of twin therapeutic approaches on certain biophysiological parameters in women after breast surgery at selected cancer hospital in Chennai (Figures 1 and 2). Figure 1: Flow chart representation of the Research design. Figure 2: Schematic representation of the study design. The study was conducted in the Oncology Department at Government general hospital Chennai. The oncology department consists of Medical and surgical care units, general wards with female and male sections and payable wards with shared rooms. Oncology units have 40 beds in total, Patients get admitted here for investigation and medical, surgical treatment and for radiation therapy, chemotherapy also. All Patients who underwent breast surgery in the department of medical oncology at Government general hospital, Chennai, during one month study period from 01.08.09 to 30.08.09 were selected. The sample size consisted of fifty women with breast surgery who met the inclusion criteria. Convenient sampling technique was used. a) Women who had ventilator support for not more than 48 h.
b) Women in the age group of 21-70 years. c) Women who can speak and understand Tamil or English. d) Women who are willing to participate. a) Women who had complications in the post-operative period like bleeding, pus collection Metabolic respiratory disorders. b) Women who underwent reconstructive surgery. c) Women who were taken up for Re exploration procedure. It consists of selected demographic variables such as age, educational qualification, income, religion, marital status and clinical variables as previous history of surgery, type of surgery and pain medication. This part consists of pain assessment tool (visual analogue scale). Pain assessment tool: This part is numerical pain rating scale. Numerical pain rating scale is otherwise called marked visual analogue. It is shown to be sensitive to pharmacological and non-pharmacological procedures which alter the experience of pain [11,12]. Practice of pranayama assessment checklist: This practice of pranayama assessment checklist contains steps of pranayama technique. Women are assessed for their appropriate practice & performance in relation to decrease in pain. Practice of arm exercise assessment checklist: This practice of arm exercise assessment checklist contains steps of arm exercises. Women are assessed for their appropriate practice & performance in relation to decrease in shoulder stiffness. Self-reported flexi level scale of shoulder function (FLEX–SF): The FLEX–SF scale was developed which is widely used in orthopeadic research. It consists three testlets (subsets of items) targeted toward high, medium, and low shoulder functioning. Patients are directed, based on their response to an initial screening item, to the level-specific testlet designed to most precisely measure their shoulder functioning. The numerical pain rating scale otherwise called as marked visual analogue scale will be used to assess the resulting pain intensity, report as a single component, the numerical rating scale is a single component, the numerical scale is a horizontal continuum ranging from 0 to 100, 0 represent no pain ‘50’ refers to moderate pain and “100” rates to worst pain (Table 1). Table 1: Pain assessment tool. This practice of pranayama assessment checklist contains steps of pranayama technique. Women are assessed for their appropriate practice & performance in relation to decrease in pain (Table 2). Table 2: Pranayama assessment checklist. This practice of arm exercise assessment checklist contains steps of arm exercises. Women are assessed for their appropriate practice & performance in relation to decrease in shoulder stiffness (Table 3). Table 3: Arm exercise assessment checklist. The FLEX-SF scale will be used to assess the shoulder function, the flexi-level scale consists of three testlets (subsets of items) targeted toward high, medium, and low shoulder functioning. Patients are directed, based on their response to an initial screening item, to the level-specific test let designed to most precisely measure their shoulder functioning (Table 4). Table 4: Flexi level scale of shoulder function. The adaptive approach is more efficient than traditional scaling, yielding maximum efficiency with minimum response burden. • The content of the tool was validated by various experts of Medicine and Nursing, physiotherapy and suggestions and modifications given by the experts were incorporated. • Reliability of the tool were subjected for (split half method and the ‘r’ value obtained was 0.9 (positive co-relation) and hence the tool was considered reliable. The investigator obtained formal permission from the head of department oncology (Paterson cancer centre) to conduct the study. The pilot study was conducted from 26.07.09 to 31.07.09 in Paterson cancer centre, Vijaya hospital, Vadapalani, Chennai The investigator utilized the convenient sampling technique to select the women from the population. Based on that four patients were selected for the study group. A pre-test, twin therapeutic approaches (pranayama & arm exercise), post test pattern was used for study group. The study was found to be feasible; the tool considered reliable and the study approach seemed to be feasible hence the investigator preceded with the main study, data collected with minor modification in the tool. Data collection for the main study was done in the postoperative unit of medical oncology Department of Government General Hospital, Chennai from August 1, 2009 to August 29, 2009. Formal permission obtained from the Hospital administrator before data collection. The purpose of the study was explained to the women’s. The investigator got prior written consent from the women’s. Explanation of the procedure and its rationale was given to the women’s. A room was provided to the women by providing privacy and restriction of visitors. Two days prior to the surgery subjects were selected and baseline status was assessed. Then naadi chudhi pranayama and arm exercise programme was taught and demonstrated to the subjects of the study group for two evenings prior to the surgery. Naadichudhi Pranayama and arm exercise programme was given as intervention for three consecutive post-operative days from day three to day five. Each day the morning intervention was given, then after 11 h the evening intervention was given for the study group. The duration of intervention was for 35 min/sessions, fifteen minutes of pranayama and 20 min of arm exercise programme. The investigator assessed the level of shoulder function on the third post-operative day morning before the intervention, then on the fifth post-operative day after the evening intervention the level of shoulder function was assessed. From the third postoperative day till the fifth post-operative day pre and post-test level of pain was assessed in the morning and evening before and after the intervention. From the third post-operative day practice of twin therapeutic approach was assessed and the Performance of pranayama & Arm exercise was guided and supervised by the investigator. Descriptive statistics & infertial statistics. • Determine the effectiveness of pranayama on pain in women after breast surgery. • Determine the effectiveness of arm exercise program on shoulder function in women after breast surgery. The data collected from study group of patients were tabulated, analyzed and presented in the tables and were later interpreted. The data obtained were mainly classified into the following section. Frequency and percentage distribution of women according to demographic and clinical variables in the women after breast surgery. Table 5 reveals the distribution of selected demographic, clinical variables of Experimental group. Out of 50 patients 6 (12%) of them were in the age group of 51-60, 17 (34%) of them were in the age group of 41-50. Table 5: Frequency and percentage distribution of women according to demographic and clinical variables (n=50). Regarding Educational qualification 9 (18%) samples were illiterates, 21 (42%) had secondary education and 3 (6%) had Hr. secondary. Regarding monthly family income 1 (2.0%) are in the category of Rs. 3001-5000 and 41 (82.0%) less than Rs. 1000. In consideration with religion, majority of the samples belonged to Hindu religion with 40 (80%). and 5 (25%) of them belong to Christians and Muslims religion. Regarding marital status 9 (18%) samples were single and 41 (82%) were married. In relation to clinical variables, in the previous history of surgery, 32 (64%) of them had no history of surgery and only 18 (36%) of them had history of previous surgery in the study group. In relation to the type of surgery the experimental groups had equal distribution of breast surgeries with 15 (30%) had total mastectomy, 7 (14%) had radical mastectomy and 28 (56%) had lumpectomy. Frequency & percentage distribution of pre and post pain level after pranayama in the in the women after breast surgery. Table 6 reveals the distribution of level of pain among patients following breast surgery. Out of 50 patients 21 (42%) of them had moderate pain in the pre-test and rest of them 29 (58%) had severe pain. 42 (84%) of them had moderate pain. In the post test and rest of them 8 (16%) had severe pain. In the pre-test evening 49 (98.0%) had moderate level of pain and 1 (2%) had severe pain. In the post test 7 (14%) of them had moderate pain and 43 (86%) had mild pain. Table 6: Frequency & percentage distribution of pre and post pain level after pranayama on III post OP day (n=50). Frequency & percentage distribution between pre and post level of shoulder function after arm exercise program in the women after breast surgery. Table 7 reveals the percentage distribution of level of pain among patients following breast surgery. In the study group 48(96%) of them had moderate pain in the pre-test and rest of them had 2 (4%) of them had mild pain. In the post-test 8 (16%) of them had moderate pain and rest of them 42 (84%) had mild pain. In evening 22 (44.0%) of them had moderate level of pain. In pre-test 27 (254%) had mild pain and 1 (2.0%) had very mild pain. In the post-test 24 (48%) of them had mild pain and 25 (50%) had very mild pain, 1 (2.0%) had no pain. Table 7: Frequency & percentage distribution of pre and post pain level after pranayama on IV post op day (n-50). Comparison of pain score among patients following breast surgery in the pretest and post-test within the women after breast surgery. Table 8 illustrates the comparison of post op pain score among women following breast surgery in the pre and post-test within the study group. On the third day morning the pre-test mean score was 75.20 with standard deviation 6.46 and the posttest mean score was 43.60 with SD 8.98. In the evening the pre-test mean score was 55.60 with standard deviation 9.07 and the post-test mean score was 29.60 with SD 6.69. On the fourth day morning before intervention the mean score was 50.20 with Standard Deviation 11.16 and after the intervention the mean score was 29.20 with SD 6.95. Table 8: Mean and standard deviation of post-operative pain during pre and post-test on III, IV, V day after breast surgery (n=50). In the evening before intervention, the mean score was 32.40 with standard deviation 11.88 and after the intervention the mean score was 14.60 with SD 6.76. On the fifth day morning in the pre-test, the mean score was 25.60 with standard deviation 5.01 and in post-test the mean score was 10.60 with SD 2.40. In the evening the pre-test mean score was 14.8 with standard deviation 6.46 and the post-test mean score was 1.20 with SD 3.85. It indicates that there is a variation in the pain level between pre-test and post-test of the III, IV, V post op day. Comparison of shoulder functions among patients following breast surgery before and after the intervention within the women after breast surgery. Table 9 illustrate the pain score among women following breast surgery on the third day morning the mean score was 31.60 with standard deviation 8.66 which is statistically significant at p<0.001. In the evening the mean score was 26.00 with standard deviation 10.10 which is statistically significant at p<0.001. Table 9: Paired ‘t’ test of post OP pain on III, IV, V day after breast surgery (n=50). On the fourth day morning the mean score was 21.00 with Standard Deviation 12.16 which is statistically significant at p<0.001. In the evening, the mean score was 17.80 with standard deviation 9.10 which is statistically significant at p<0.001. On the fifth day morning the mean score was 15.00 with standard deviation 5.05 which is statistically significant at p<0.001. In the evening the mean score was 13.60 with standard deviation 4.85 which is statistically significant at p<0.001. This clearly indicates that the intervention has influence on pain perception. The analysis of pain scores of study group applying paired ‘t’ test reveals a highly significant difference (P<0.001). Effectiveness of pranayama on pain among patients following breast surgery in the women after breast surgery. Table 10 illustrates the pain score among women following breast surgery. On the third day morning the mean score was 31.60 with standard deviation 8.66 which is statistically significant at p<0.001. In the evening the mean score was 26.00 with standard deviation 10.10 which is statistically significant at p<0.001. Table 10: Paired ‘t’ test of post OP pain on III, IV, V day after breast surgery (n=50). On the fourth day morning the mean score was 21.00 with Standard Deviation 12.16 which is statistically significant at p<0.001. In the evening, the mean score was 17.80 with standard deviation 9.10 which is statistically significant at p<0.01. On the fifth day morning the mean score was 15.00 with standard deviation 5.05 which is statistically significant at p<0 .In the evening the mean score was 13.60 with standard deviation 4.85 which is statistically significant at p<0.001. This clearly indicates that the intervention has influence on pain perception. The analysis of pain scores of study group applying paired 0 ‘t’ test reveals a highly significant difference (P<0.001). Table 11 reveals the comparison of shoulder function score among women following breast surgery within the study group. In the study group, on the third day morning in the pre-test mean score was 40.00 with standard deviation 4.04 which is statistically significant at p<0.001. On the fifth day evening in the post test mean score was 87.60 with standard deviation 13.33. Table 11: Paired ‘t’ test of post OP shoulder function on III & V day after breast surgery (n=50). This clearly indicates that the intervention has influence on shoulder function. The analysis of shoulder function scores of study group applying paired ‘t’ test reveals a highly significant difference (P<0.001). Effectiveness of arm exercise on shoulder stiffness women after breast surgery. Table 12 Shows the Percentage distribution of level of shoulder function among women following breast surgery. In study group the third post-operative day morning shoulder function assessment reveals 49 (98.0%) of them had movement towards gravity and palpable contraction 1 (02.0%). In the fifth post-operative day evening muscle power assessment reveals movement against gravity five (10.0%) and 21 (42.0 %) of them had movement against gravity with minimum resistance, 24 (48%) movement against gravity with maximum resistance. Table 12: Frequency & percentage distribution between pre- and post-level of shoulder function after arm exercise programme (n=50). Table 13 shows the Percentage distribution of level of the pranayama practice score among patients following breast surgery. In study group the post-operative day practice assessment reveals eight (16.0%) of them practiced in the level of moderately satisfactory, 42 (84%) of them practiced in the level of satisfactory. Table 13: Frequency & percentage distribution of level of pranayama practice score among women after breast surgery (n=50). Table 14 shows the Percentage distribution of level of the pranayama practice score among patients following breast surgery. In study group the post-operative day practice assessment reveals 8 (16.0%) of them practiced in the level of moderately satisfactory, 42 (84%) of them practiced in the level of satisfactory (Figure 3). Table 14: Distribution of level of arm exercise practice score among women after breast surgery (n=50). 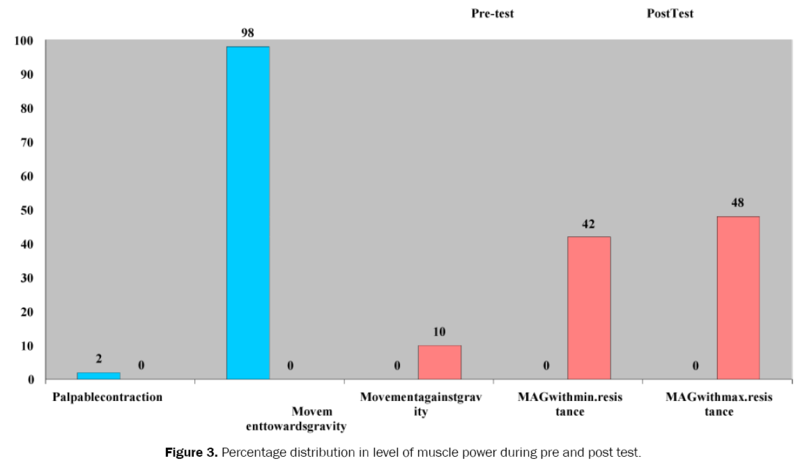 Figure 3: Percentage distribution in level of muscle power during pre and post test. Correlation of practice of pranayama with the pain among women after breast surgery. Table 15 shows relationship between level of pain and practice of pranayama among women under gone breast surgery on the third day morning pre-test ‘r’ value was -0.423 and post-test ‘r’ value was -0.163. In the evening the pre-test ‘r’ value was -0.264 and post-test ‘r’ value was -0.106. Table 15: Correlation between level of pain & pranayama practice on III, IV, V post op day (n=50). On the fourth day morning pre-test ‘r’ value was -0.291 and post-test ‘r’ value was -0.003.In the evening the pre-test ‘r’ value was -0.295 and post-test ‘r’ value was -0.168.
on the fifth day morning pre-test ‘r’ value was -0.179 and post-test ‘r’ value was -0.082.In the evening the pre-test ‘r’ value was -0.374 and post-test ‘r’ value was -0.248. It indicates that relationship between level of pain and practice of pranayama is highly co-related. Correlation of practice of arm exercise programme with the level of shoulder function among women after breast surgery. Table 16 shows relationship between level of shoulder function and practice of arm exercise among women under gone breast surgery. Table 16: Correlation between level of shoulder function & arm exercise practice on iii, iv, v post op day (n=50). In post op III day morning pre-test r–value shows (-0.185) and in the V post op day post-test r-value shows 0.853. It indicates that relationship between level of shoulder function and practice of arm exercise is highly co-related. Association of demographic variables with level of pain and shoulder function among women after breast surgery. Table 17 shows the chi–square test revealed that there was a significant association with the demographic variables such as type of surgery at the P<0.05. Table 17: Association of demographic variables with level of pain among women after breast surgery (n=50). Table 18 shows the chi–square test revealed that there was a significant association with the demographic variables such as age and type of surgery at the P<0.05. Table 18: Association of selected demographic variables with level of shoulder function among women. Association of demographic variables with level of pranayama and arm exercise practice among women after breast surgery. Table 19 shows the chi–square test revealed that there was a significant association of the demographic variables such as age and type of surgery at the P<0.05. Table 19: Association of demographic variables with level of pranayama practice among women after breast surgery (n=50). Table 20 shows the chi–square test revealed that there was a significant association of the demographic variables such as age and type of surgery at the P<0.05. Table 20: Association of demographic variables with level of arm exercise practice among women after breast surgery (n=50). The investigator has drawn the following implications from the study which is of vital function to the field of nursing practice, nursing education, nursing administration and nursing research. Nurses predominantly play a vital role of primary care giver in hospital setting for patients subjected to major and minor breast surgeries. The nurses are well aware of the pain and shoulder stiffness, lymph edema experienced by patients after breast surgeries. Hence the nurses have to implement non pharmacological interventions as pranayama and arm exercise, cryo therapy in order to reduce the level of pain, anxiety, shoulder stiffness and promote the comfort of the patient. The implications drawn from the present study is of vital concern to the health team including professional nurse practitioners, nurse administrators, nurse educators and researchers. Nurses working in the general surgical wards, oncology wards, neuro wards, renal wards and cardio thoracic wards come across post-operative patients with pain and anxiety, lymph edema arm stiffness more frequently. Soon after the analgesic effect weans off for all post-operative patients with pain the nurses can install the arm music and yoga, arm exercise as adjuvant to medication which can be made accessible to patients through the twin therapeutic approaches. The nurse in the community level can also teach the village health nurses who come across patients with pain and edema, shoulder stiffness. Through this scientific based education the nurses can improve the comfort of the person. The nurse can also teach the patient as well as the family members how to carry out intervention at home level, which minimizes not only pain but also reduces stress and cost [13,14]. Nursing administrator should conduct an in-service education program on management of pain and, prevention of oncosurgery complications to nursing professionals. Pain and prevention of onco surgery complication. Management should focus on pharmacological and non-pharmacological interventions. Continuing education on current trends in pain and management of breast surgery complications assessment can provide up to date information to post-operative wards. The nurse administrator can formulate policies and procedures regarding pranayama, arm exercise and can utilize this strategy for better quality care. The subjective nature of patient’s pain and anxiety, discomfort, edema, arm stiffness should be explored in greater detail during the education process. The importance of pain and anxiety, edema, shoulder function assessment, documentation and management under the categories, location, quality, intensity, duration, verbal and non-verbal reports should be addressed. The nurse educators can include arm exercise and yoga therapy as an intervention for pain & shoulder stiffness in nursing curriculum. Students may be given chances to practice and to give health education; and a continuing nursing education program, Workshop, seminars and conferences on this subject can be organized. 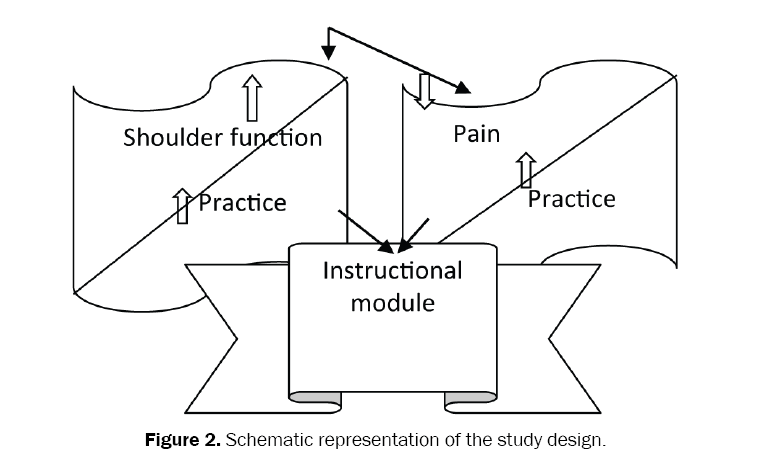 Research enhances the body of knowledge, this study helps the nurse researchers to develop insight into the development of teaching module and materials on various other aspects of pain and shoulder stiffness management for (breast operated) postoperative patients. The effectiveness of the study for the research field is verified by its utility by the nurses in the practical field and research can promote many studies on this topic among various patients. The nurse and nursing students should be encouraged to do research in the field of interest regarding management of pain and shoulder stiffness, lymph edema. Nurses should assist the patient to participate in practicing pranayama and arm exercise programme. • Video, Handouts, posters and other visual aids regarding pranayama, arm exercise programme, breast self-examination could be given to women with breast cancer and school girls. • A similar study can be conducted as an experimental study with randomization. • This study can be replicated on a larger scale. • A comparative study can be conducted using pranayama and relaxation music. • The study can be done by maximizing time period of pranayama. On the basis of the findings of the present study there was Advancing age related to increasing risk of breast cancer, level of pain also the type of surgery was associated with level of pain and shoulder function, complication related to breast surgery. Therefore it is to be concluded that the study participants may get benefited by practice of pranayama and arm exercise program. Aiten, et al. Text book of anaesthesia. 3rd edn, Churchill Livingstone, New York. 1996;31-32. Angelique S. Effect of pranayama on post-operative BRE surgery patients. J Yoga. 2007;19:23-24. Tomey AM. Text book of Nursing theorist and their work. 4th edn, Mosby Publication. 1998;351-363. Harvey. Text book of oncology. 8th edn, Elsevier Publication, Philahedhepia. 2007. Hertzog M. Sedative music reduces anxiety and pain during end stage of cancer. J Pain. 2004;12:197-203. Haltan J, et al. The impact of physical activity and guided relaxation following surgery. A randomised controlled trial. J Adv Nurs. 2002;37:199-207. Mok E. Effects of music on patient anxiety. J AORN. 2003;77:401-406. Polit D, et al. Text book of pain nursing research, principles and methods. 8th edn, Lippincott, Philahedhepia. 2004;340-346. Perry PA. Relaxation technique and cancer pain. J Cancer Pain. 1995;26:112-114. Potter. Text book of fundamentals of nursing. 6th edn, Moby publication, Philahedhepia. 2004;657-658. Rowbotham D. Postoperative pain. Prescribers Journal. 1993;33:237-243. Schafheutle EI. Why is pain management suboptimal on surgical wards? J Adv Nurs. 2001;33:728-737.
WHO. Incidence of breast cancer. 1999. Williamson J, et al. Randomised controlled trial of exercises after mastectomy. BJOG. 2002;109:1050-1055.